Vehicles imported into the 20th-Century Chinese warlord states and Republic of China that were used in WW2 and Chinese Civil War in early tiers, And The vehicles designed by People's Republic of China (Communist China) and Republic of China of Taiwan, Tanks tend to carry the largest possible calibers into battle but pay heavily for the privilege. China's tank development consisted of three phases. Prior to 1950 China relied on foreign made tanks purchased from or supplied by France (Renault NC31), Britain (Vickers Mk.E B), the USA (M5A1 Stuart), as well as tanks seized from Japan at the end of WWII (Chi-Ha). 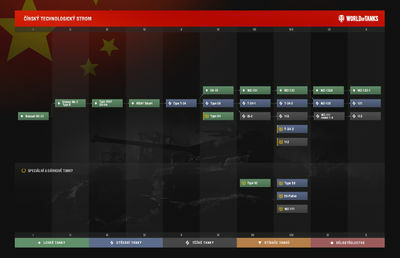 Chinese tanks through Tier-4 represent this period. In the early 1950s China was heavily influenced by vehicles of other nations, notably the T-34 and the IS-2, which were provided to China by the Soviets together with design and fabrication assistance for local production. By the late 1950's China began developing its own tanks by making modifications and improvements on the Soviet T-54 design. The Chinese Type-59 main battle tank and Type-62 light tank were the first Chinese tanks to be mass produced. The tier 6 premium light tank Type 64 was produced by the ROC from Taiwan, which strongly resembles some USA light tanks characteristics, being somewhat agile and fast firing gun. Chinese tanks, for the most part, have unparalleled mobility, good camouflage values and sloped armor. This makes their tanks very flexible regardless of if they are a heavy, medium, or light. They still play as you would expect, but they can often change their combat role a bit, should it be necessary. However, they have very poor gun depression, even worse than German or Soviet tanks, and arguably the worst in the game. They also have very poor module health, and their modules are densely emplaced. This results in frequent crew loss, destroyed tracks, fuel tank fires, or even ammo rack detonation. However, while most Chinese tanks have (comparably) poor hull armor, their turret armor is unparalleled, sometimes even surpassing the hull armor values of heavy tanks. Chinese Light Tanks are fast, agile, and have good penetration and alpha damage. They play very much like medium tanks. Their armor, Although it's sightly better than foreign counterparts (late tier tanks had almost tough protection as medium tanks) is really the only thing identifying them as light tanks. They suffers from poor gun depression and vulnerable modules. Chinese Medium Tanks are, up to a point, very similar to the Soviet ones, combining mobility and firepower, at the expense of a low rate of fire and poor gun handling. At higher tiers they gain firepower and become more adept at brawling than their Soviet counterparts, while being less well-rounded. Chinese Heavy Tanks are also similar to the Soviet models on which they were based. These tanks have good frontal armor and acceleration and faster rates of fire, which makes it possible to play them as "heavy" mediums. Later on they focus more on armor sloping and high maneuverability. Chinese Tank Destroyers are mostly fictional "what-if" vehicle based on existing platforms. The line starts out with converted seized/imported tanks at Tiers 2 - 4 with decent sustained damage output and mobility, making capable supporters and ambushers, but lacking armor. At Tiers 5-7 are conversions of domestic made vehicles, which still retain the glass cannon trait. At Tiers 8 - 10, Chinese TDs drastically changed by trading off mobility for heavier armament and protection as switching to heavier base models. Top tier vehicles, the WZ111G FT and the WZ113G FT carry heavy guns comparable to Soviet ones, and very thick frontal armor with high HP pool capable of standing against punches as German Jagdpanzers could. Like most other Chinese vehicles, they are generally hampered by below average accuracy thus don't snipe so well. This page was last modified on 9 April 2018, at 18:12. This page has been accessed 2,259,268 times.